Being a successful professor means preparing students to be successful. Delivering knowledge-centered classes on a particular topic is no longer the primary task of professors. Gone are the days of the large lecture halls, professor front and center, exhibiting knowledge for students to somehow absorb. Scholars are now calling for students and professors to engage in a new learning paradigm that provokes the development of specific skills for the 21st century. This paradigm includes teaching five major career skills that are highly sought after by employers today. Mastering these five essential skills means that students: 1) thrive on change by being receptive to feedback, 2) are able to get things done independently and without direction, 3) are open-minded, understand their own biases, and appreciate differences in others, 4) know how to prioritize tasks, and are good at influencing behavior of others, 5) facilitate activities and relationships within an organization, (Kivunja, 2014). This is not an easy feat as skills need time and practice to be cultivated. 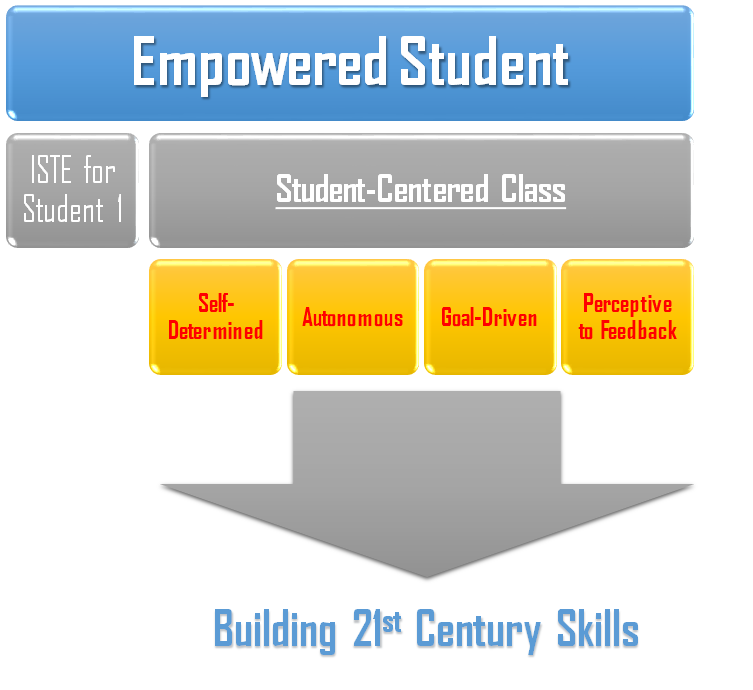 The first ISTE standard for students calls for the empowered learner as a mechanism to help build 21st century skills. The empowered learner is one that, “…leverages technology to take an active role in choosing, achieving, and demonstrating competence in their learning goals,” (ISTE, 2017). An empowered student is one that is at the forefront of their learning by thinking beyond the lecture and is autonomous because they have intrinsic motivation, (Stefanou et. al., 2004). So if students need to develop self-determination and become autonomous in order to thrive in the current workforce, are we, as educators, doing our part in preparing them to do so? This question can only be answered positively if we adopt a student-centered approach to teaching. The authors of the book, Understanding by Design, challenge educators to consider the backward design approach. In this design approach, the educator starts their plan with the desired results, determines which indicators are appropriate for measuring the outcomes of their results, then plans the experiences and/or instruction required to achieve these outcomes, (Wiggins & McTighe, 2005). When students are informed of the desired results and are allowed to take part in the creation process, that’s when self-determination and autonomy develops, (Stefanou et. al, 2004). It is also important to remember that students are still developing these skills so simply stating the purpose or goal of an assignment and leaving them to their own devices will not help them develop autonomy. Coupled with the student-centered approach, formative feedback must be included to help guide and remind students of the big-picture results. Formative assessment when conducted as a feedback loop helps to “enhance performance and achievement,” (Wiggins, 2012). Essentially, this means that students are given consistent, on-going, and immediate feedback as a way to encourage continual practice of skills. Formative feedback is not evaluated formally (i.e. no grades are assigned to the feedback) and does not offer extensive evaluation, advice, nor it is purely praise. Instead, formative feedback offers the student a “gauge of their efforts to reach a goal”, (Wiggins, 2012). In order to provide good feedback, the assessor must first observe, then comment or ask questions on those observations, (Wiggins, 2012). 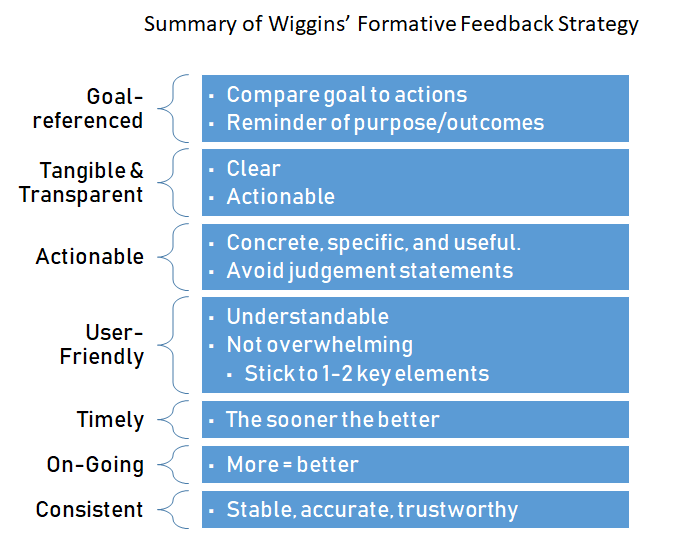 Figure 1.2 summarizes Wiggin’s strategy on formative feedback. Putting the Theory Into Practice: The Investigation. 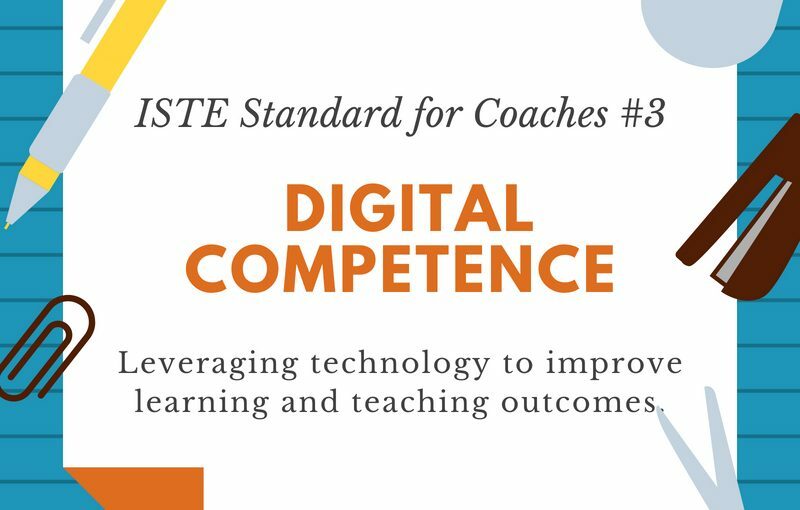 In our digital education leadership program, we were asked to create a question(s) related to the classes we teach and investigate a resource(s) that would aid in addressing the first ISTE standard for students. I teach a nutrition research class whose main purpose is to develop not only students’ research skills but also build autonomy as researchers. Students must investigate a food-related issue, then design and implement an experiment, later report their findings through a final research paper. This class explores the research process including hypothesis creation, experiment -building and -testing, and scientific writing. The current challenge is to allow enough freedom for autonomy to develop while providing direction to ensure correct research protocol is established. I began my brainstorming process for a student-centered approach to the issue by first identifying the important design outcomes. I started with a goal: Allow students to take their research project into their own hands while working toward a common goal and using the research protocol. Though students will be developing autonomy and need to be self-driven, they will also need appropriate feedback in order to gauge their work at critical points in the quarter. With this goal in mind, two main questions developed: 1) What feedback timeline would be most effective to design a researcher-centered approach to teaching nutrition research classes? and 2) What computer driven-tools would effectively provide timely and ongoing feedback? The findings of my investigation and potential resources are explored below. Question 1: What feedback timeline would be most effective to design a researcher-centered approach to teaching nutrition research classes? Upon further investigation, this question can’t be answered directly. Each assessment will vary in scope and length, therefore a prescribed timeline is not feasible. 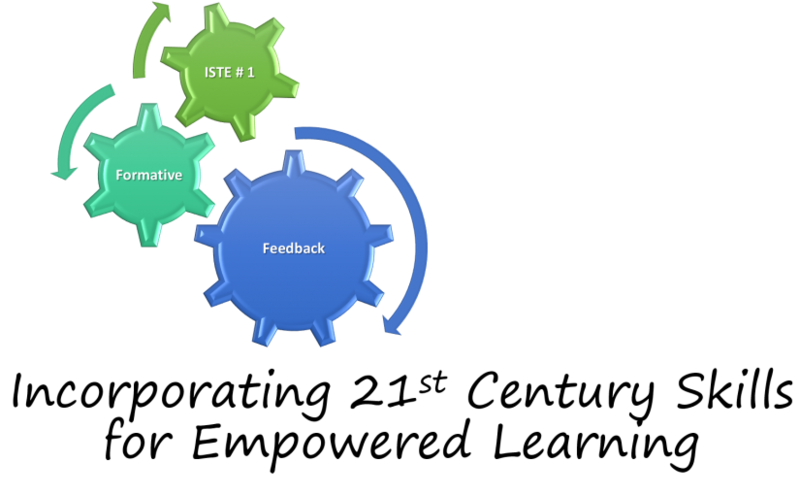 However, according to education leaders Hicks and Wiggins, they both agree that formative feedback is the best approach using the student-centered or researcher-centered approach. As a reminder, formative feedback is not formally assessed but rather allows the student/researcher an opportunity to take a step back to evaluate and reflect upon their own work in relation to their research goals. The timing of feedback should be immediate, ongoing, and consistent,(Hicks 2014, Wiggins 2012). Feedback should follow a specific format which does not make judgements nor evaluates the work. Hicks references the RISE model (see figure 1.3) to format formative feedback in a meaningful way, which is why I’ve chosen the model as the resource of choice for this question. 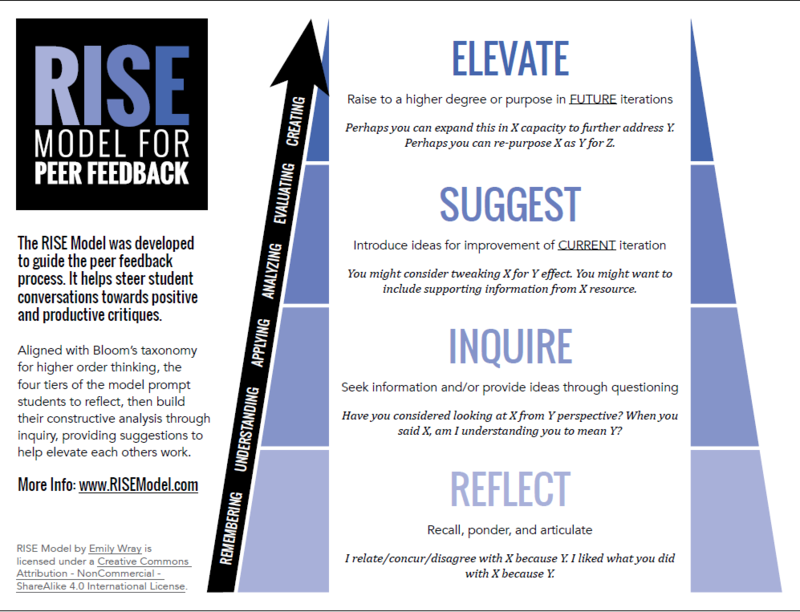 The RISE model can be used for self-assessment, peer-review, or evaluator review in formative feedback. The process begins by assessing the degree to which the current work meets the goals/objectives of the assignment. The subsequent steps allow for specific, tangible, and actionable suggestions to the author for improvements on their current version and future version of the work. The benefit of using this model is that as the feedback advances towards higher steps, it also involves higher level of thinking. RISE allows the user to get at the heart of student-centered learning by allowing students to evaluate and create works. I have not used this model in action but my predictions for any drawbacks may involve peer-feedback where students skip a level or provide judgements without fully understanding the model itself. These concerns could be combated with scaffolding and more detailed instruction on the feedback process. Question 2: What computer-driven tools would effectively provide timely and ongoing feedback? For an assessment item such as a research paper, using a collaboration tool such as G suite or the Google Doc Collaboration feature in CANVAS is ideal. Google Docs are available to anyone that holds a gmail sign-in, along with several other features of the G suite including: to-do lists, calendar, google hangout, and gchat, just to name a few. The Google Doc collaboration feature in CANVAS allows students to access a google doc on one google drive (usually belonging to the instructor). The owner of the google drive would then have access to all of the collaboration pages for the class. The use of these collaboration tools is appealing because the docs are easily accessible by students, the professor, or individual providing the feedback. Formative feedback is simple to provide using the “comment” feature. Google Docs also track changes throughout the life of the document and provides comment notifications in gmail. Using Google Docs would also help address issues related to equality of work among team members (i.e. members doing their fair share of the collaboration). 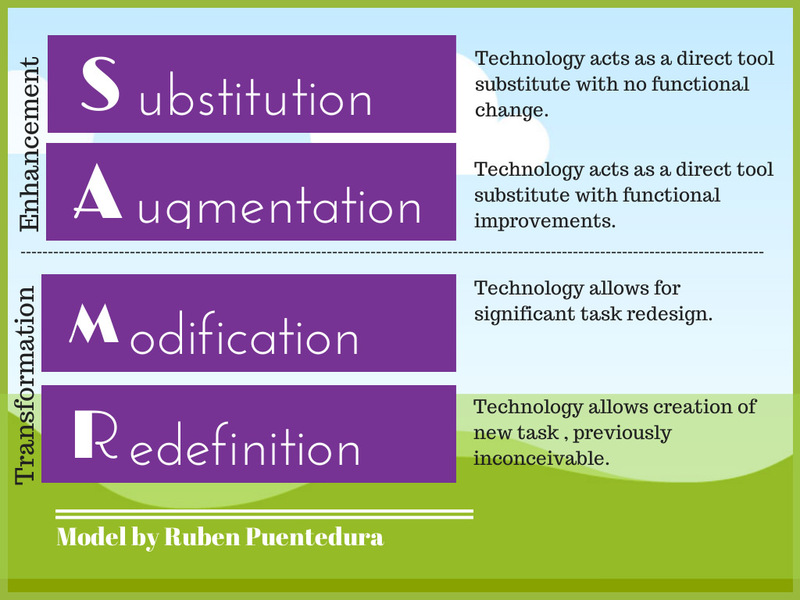 To further my justification of this technology, it would help me improve my current assignment by achieving M and R from the SAMR model. Google Doc collaboration also scores roughly a 14 on the Triple E rubric (according to my assessment of intended use). The only downside related to the collaboration tool feature in CANVAS. The feature is not intuitive and somewhat difficult for students to access. It is also not well integrated with Google Docs, for example, simply placing students into groups on CANVAS and assigning these groups to a Google Doc collaboration does not automatically give students access to their group’s Google Doc in the drive. The instructor has to manually give permission to each student. The collaboration feature also does not link instantly to the gradebook or back to CANVAS where other course materials/resources would be kept. The RISE model and Google Doc tool were well received by my colleagues when evaluating them as resources that resolve my two questions on formative feedback. Not surprisingly, others also shared similar concerns with using Google Doc as a collaboration feature in CANVAS. Since Google Docs can be used independently of CANVAS, this is not a big issue particularly since formative feedback is not associated with a formal grade therefore an association with CANVAS materials or gradebook is not necessary. Interestingly, most of their feedback on these two resources related to implementation, namely what assessment tools would/could be used to implement the RISE model and would/could Google Apps for Education help facilitate this assessment function? My initial reaction on creating an assessment tool to implement the RISE model was to create “guiding questions” students would answer as part of their feedback comments. By answering the questions fully, the students would effectively go through the entire model without skipping steps. I have yet to investigate other Google Apps for Education for feedback features. Though I do not have complete answers to these great questions, I do have the beginning of of my next investigation: Feedback Implementation. Stefanou, Candice R., Perencevich, Kathleen C., DiCintio, Matthew, & Turner, Julianne C. (2004). Supporting Autonomy in the Classroom: Ways Teachers Encourage Student Decision Making and Ownership. Educational Psychologist, 39(2), 97-110. Wiggins, G. (2012, September). 7 keys to effective feedback. Education Leadership. 70 (1). Wray, E. (2018). RISE Model. Retrieved from: http://www.emilywray.com/rise-model.